Happy Tuesday everyone, I hope your week is off to a great start! I am definitely experiencing some cabin fever these days and so wish I could jet off to somewhere warm. But sadly I am too busy “adulting” these days so I can only pray for an early spring. The weather certainly did warm up on the weekend so it was nice to get some fresh air. For today’s post I am doing something I don’t normally do and that is share a look that is made up of pieces that have sold out or are older items from my closet. I shot this look back in November and things quickly sold out on me so I hadn’t shared it. But my friend Nikki of the blog NikkiFreeStyle inspired me with her recent closet clean out and new series on her blog where she takes pieces from her closet that she has never worn or hasn’t worn in a while and re purposes them. I am not going to steal her fabulous idea long term but let’s just say it helped me decide to share this look – thanks Nikki! Being fashionable doesn’t mean you always have to buy new clothes and as a blogger I don’t expect you to mimic my style because we all have our own personal sense of style so I think it is good to showcase a look that is simply meant to be a source of inspiration. Whether it encourages you to try a different silhouette, a type of clothing you never have, or prints and colours you tell yourself you would never wear, I will be thrilled. And being able to mix and match new pieces with old ones from your closet is a key to being a true fashionista. I love finding pieces in my closet that I haven’t worn in quite some time and realizing that they work perfectly with something that I just bought. And this was certainly the case with this look. But I do admit that since I started blogging I have felt the pressure to keep bringing you things that are new and available for purchase and so I wasn’t being as resourceful as I normally am. This cape is part of Prabal Gurung’s fall collection for Lane Bryant. I love a cape as an alternative to a jacket because they are light weight and give you arm freedom. It is a super easy layer to throw on that still allows you to see a sneak peek of your look underneath. This cape caught my attention because of the rich vibrant colour. I can’t exactly figure out what colour I would call it but it was referred to as “Autumnal” in the product description. It definitely has that rich copper and amber feel to it. And the pictures on the website didn’t fully show you the true vibrance of this piece so when I picked up my order and took it out of the package I was mesmerized with it. So were the wonderful sales associates in the store lol. 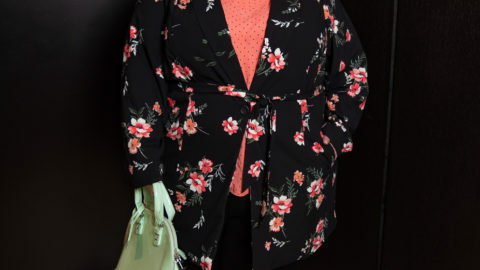 Outer wear can be a hit or miss for me from Lane Bryant depending on the shape and style and whether the sizes are individual or split. I am wearing the size 28 and I was very happy with the fit. I think that making it in individual sizes really helped with getting a good fit. I think it is hard to group all of us into only 4 sizes. The cape is made of a high quality wool blend and is expertly tailored. Sometimes a cape can look too over sized and sloppy but this one has tailored seaming, flat front pockets, a two button closure and a structured collar. And it is fully lined. When the colour of the cape wasn’t what I expected I found myself having to rethink what I was going to pair it with as I had already had something in mind but when I saw the actual colour in person I realized it wouldn’t work. I started scouring the web looking for pieces to go with it and I was left very uninspired. I could have done black but I just wasn’t feeling it. So I was like ok Lisa what do you have in your closet, what haven’t you worn yet? And as I started looking through the endless selection that I have (yes I really do need to do a closet sale!) I found this skirt from ELOQUII. This skirt was something that I had my eye from when it first came out but it was something I could never pull the trigger on for some reason. Then sometime in the summer it went on deep clearance and I was able to score it for like $15. That’s when I decided it was meant to be and in my cart it went. I love a good midi skirt and this was a simple pleated metallic one with stripes of silver, pale blue and gold. When I pulled it out and put it against the cape I was like oooohhh I really like this combination. Since I was wearing some luxe fabrics with the cape and skirt I wanted my top to also have that luxe feel and that’s when I pulled out this satin blouse from Melissa McCarthy in a classic white. It has a simple v-neck and button cuffs with a timeless silhouette. This piece had also been sitting in my closet for quite some time. It was like it was waiting for the perfect pieces to say wear me, wear me lol. To accessorize this look I played off of the colour palette and incorporated things that I already had in my very large accessory collection. These gold shoes from Full Beauty are a staple for me and you will be happy to know that they have restocked them and added some new colour options. I also love this classic Coach bag with its studded detail that gives it a unique look. I then added a floral statement necklace in soft pastels and a metallic earring and bracelet. Overall I love how this look turned out, it was unexpected and reminded me to not dismiss what I have in my closet because you never know what treasures you may find. Oh and I also refused to pay full price for this cape, I got it 60% off. I remind you to always look out for the sales that LB has and use those coupon codes! It was super windy the day we shot this look so I definitely felt like I was going to get swept away which is clearly evident in the photos but that’s what you get for shooting in the elements. Do you have something in your closet that you haven’t worn? I challenge you to style a new look that includes it and see what you come up with. Special thanks to Ceara of CK Photography for capturing these looks. Love the colour of that cape Lisa – it really suits you! Lisa, this article came at a prefect time for me! I’m going to be moving in June and was feeling bad about not wanting to get rid of anything from my massive wardrobe. I’m always finding new ways to wear what I have. You just made me feel better. You know, I have a lot more admiration for bloggers who DON’T show only new pieces. I *get* the reason for wanting to show only currently available items but most of us can’t buy every new thing we see and like. I’m much more likely to follow a blogger who shows how to repurpose the same item over and over in different ways. Like you said, more of an inspiration vs. “go buy this exact item.” And I bet many others feel the same. So feel good in your “old clothes,” cuz that’s what most of us hace to work with! And I’m CRAZY for this skirt. It’s gorgeous with your coloring and that necklace is perfect with it! Oh my god, Lisa! This dress is gorgeous! I really love the different colors of gold, and blue. I’m also a huge fan of that cape, I love the split front, it really makes it an unique piece. I love the cape! beautiful pictures Lisa!